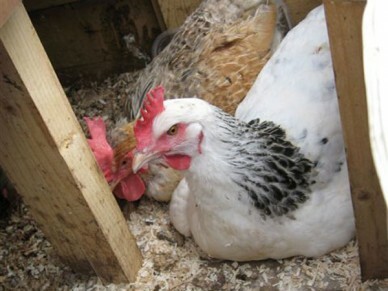 A hen is said to be egg bound when she is unable to lay. This is a condition which may result from inflammation of the oviduct, malformed or double yolked eggs, or an egg which has formed too large for a bird to pass. Tell-tale signs include restlessness and the hunched up stance of a hen that is obviously unwell i.e. head pulled into her neck or tucked under her wing, tail down, eats and drinks very little (if at all) and her feathers looked ruffled. Regular visits to the nest will be apparent in an attempt to lay her egg and the constant excessive pushing by her to eject the egg can result in a prolapse. A very bad smell might be noticeable. This could be the build up of faeces and urates (urine) behind the egg. It could also indicate that she has developed an infection if the egg has cracked and is leaking internally. If the sufferer is a daily layer there may be eggs ready for laying behind the one that she can’t pass. It is possible that one or more of these have been damaged due to the excessive pushing by the hen. You must keep a very close eye on her abdomen for signs of swelling, excessive heat, redness or patches of discolouration; an indication that she may have started with peritonitis. Her vent will look red and sore and might protrude. An egg bound hen needs immediate help. You will need a container large enough to get her whole body into it. A kitchen sink or a baby bath is suitable or, if she is a bantam, she will probably fit into a washing up bowl. Before bathing her try giving her a sweet drink e.g. sugar water, honey in water or glucose in water to relax her. Run some warm water into her bath; the water should be slightly warmer than her own body temperature and just deep enough so that her bottom half can lie in the water. Add some baby shampoo or, if there are no babies in the house, just put in half a teaspoon of salt which will help to stave off the start of any infection. If you have any lavender oil or tea tree oil add two but no more than three drops of either or a mixture of both of the aforementioned oils to the water if she’s a standard or large hen. One drop of each oil is sufficient for a bantam. Lavender oil will be relaxing and soothing on her skin and tea tree oil will help kill any infection considering taking up residence in or around her vent or abdomen. Lower her gently into the water to give her a chance to get used to it. Once her lower body feels the warmth from the water she will relax naturally. When she has settled you should massage her abdomen applying gentle pressure. If you use too much pressure you can easily damage the egg(s) inside her. Massage using a circular motion but all the time you need to be massaging in the direction of the vent. This massage combined with a warm, relaxing bath and some gentle encouragement from you is usually all that’s needed for the hen to pass the egg with one final push. Although it sounds like a long time try to keep the vent area submerged for approximately 30 minutes. It is important that the hen be made as relaxed as possible in order that the vent area is supple enough for her to pass the egg. Once she has been dried thoroughly you can rub some lubricant around and just inside the vent. This serves two purposes; it soothes her sore vent and it will aid in ejecting the egg once the muscles have relaxed. 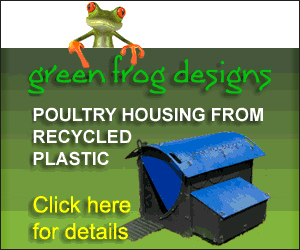 If she has a red and swollen vent keep her in an isolation cage to avoid the other hens pecking at it. Put plenty of newspaper down first and then heat some towels in the microwave but please ensure they are just warm and not hot. The warm towels will act like a heated pad underneath her. Leave her for a while to see if she passes the egg, if not, repeat the bathing procedure in the evening when she will be ready to settle down for the night. Ensure she is thoroughly dry before returning her to her crate that you will have prepared with more warm towels. Cover the crate to ensure it is draught free. Hopefully she will have passed the egg overnight or in the early morning. Some people just use the heated pad, this sometimes relaxes the muscles enough and allows the egg to slip out. Assuming this method does not work, you could resort to removing the egg yourself by lubricating inside the vent with one hand and pushing gently on her abdomen in the direction of the vent. This method involves rupturing the egg and removing all the pieces of shell. Personally I don’t advocate this method unless it is done by a very experienced chicken keeper or a vet as it can be an intricate and stressful procedure. If your egg bound hen has not responded to the warm bath method after 48 hours you should take her to a vet who will remove the egg and any bits of broken eggshell. If any of the latter are left behind, the sharp edges can cut the hen’s internal tissue which can lead to further difficulties. Keep an eye on your hen for signs of lethargy, dull eyes, not eating or drinking and check her abdomen for swelling, redness, heat or discolouration and if you suspect peritonitis get her to the vet as soon as possible.